Plot Summary: Zeus is an old god that's always trying to have "fun" behind Hera's back. 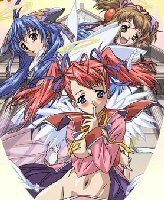 Three pretty angels have caught his eye and he'll do anything to explore the possibilities of an angelic night of eros. But he's got to be sly or Hera will have his head. Perhaps it's time to put these angels through some challenges on Earth where Zeus might be able to go unnoticed.